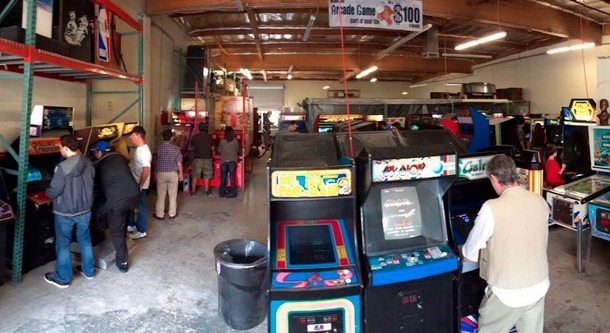 The business of Royce’s Arcade Warehouse in Chatsworth is buying, selling, renting out, and repairing classic arcade consoles, but on one special day every week they open their showroom to the public to play games all-day long. Best part? Don’t worry about bringing your quarters or any freshly pressed bills to insert into the change machine, because every game is switched to ‘free-play’ mode. Yes, you heard me right. 100% FREE! Among the lineup of arcade classics on hand include the likes of Donkey Kong, Street Fighter 2, NBA Jam, Ms. Pac-Man, Joust, Frogger, Galaga, TMNT, Virtua Cop, and many more, all available to play free of charge from 10:00am to 3:00pm every single Saturday. Now, I will admit up until I read a Facebook post shared by Hidden L.A., I hadn’t even heard of Royce or his warehouse, but if Yelp is any small indication (there are 20 reviews as of 8/1/15, all overwhelmingly positive), then this place sounds like an absolute ray of sunshine. Yelpers have called the warehouse “incredible” and “a wonderful hidden gem.” And as for the owner Royce, he was lauded for his friendliness and knowledgeability. Looking for something fun to do today? Don't forget about Royce's Arcade where EVERY Saturday our whole Arcade is on freeplay, from 9-4. Sounds like a high-scorer to me. Will definitely have to make my way down there sometime soon. Royces Arcade Warehouse is located at 21817-A Plummer St, Chatsworth, CA 91311. For more information, visit roycesarcade.com.